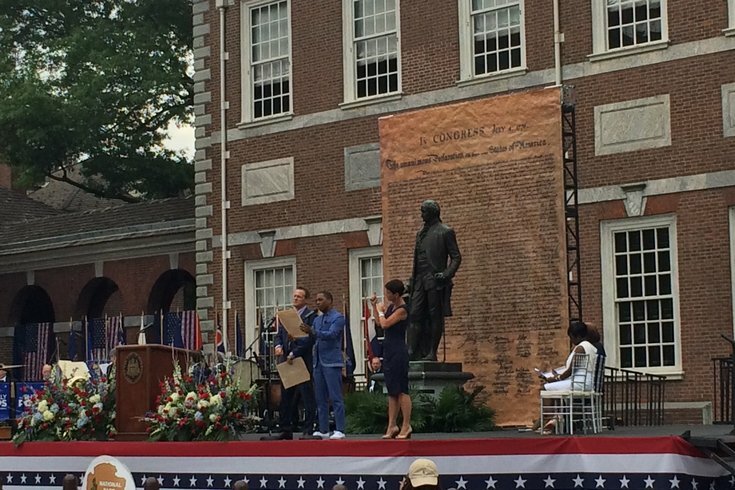 Leslie Odom Jr. - star of the Broadway hit 'Hamilton' - reads a passage from the Declaration of Independence to help kick off the city's Fourth of July celebrations. It's fair to say there's no better place to spend the Fourth of July than Philadelphia. Here in the cradle of liberty, the birthplace of our modern United States, city officials gather every year in front of Independence Hall in Old City - where the Declaration of Independence was signed so many years ago - to celebrate our country's independence from tyranny. And, this year, marking America's 240th year of independence, was no different. During the morning festivities, The Philly Pops warmed up the gathered crowd - a group of thousands gathered at Independence Mall, all awaiting the parade - and Sheila Hess, Philadelphia's city representative opened the day. After Bobby Hill, a teenage choir boy from Andorra who sang for Pope Francis during his visit to Philadelphia last year, sang the National Anthem, Leslie Odom, Jr., a Tony award winning actor in the hit Broadway show "Hamilton" and Tom Verica, star of the TV show "How to Get Away With Murder," read selected passages from the Declaration of Independence. Later, both Philadelphia-born celebrities were honored by city council members Cherelle Parker (D, 9th), Mark Squilla (D, 1st) and Blondell Reynolds Brown (D, at-large). "Philadelphia, you look beautiful," said a smiling Odom, in addressing the gathered audience. "Everywhere I go in this world, I am a Philadelphia artist." Odom told the crowd that his experience growing up in Philadelphia has built him into the man he is today. He said that the "foundation" of his career began in the City of Brotherly Love and that he hopes he's doing right by the city as he continues his career. "I take you every place I go. I hope I'm doing you proud," said Odom. Verica, too, acknowledged Philadelphia's place in his heart and said he was honored to be a part of the day's celebration. "My roots are firmly planted deep in Philadelphia," he said. Later, Mayor Jim Kenney took to the stage to honor Philadelphian musicians, Kenny Gamble and Leon Huff for their contributions to the city's music scene. After a chance meeting in a elevator in the 60s, Kenney said, Gamble and Huff collaborated on many songs - including “If You Don’t Know Me By Now," "Me & Mrs. Jones" and "“You’ll Never Find Another Love Like Mine." Kenney - who said that celebrating his first Independence Day as mayor of Philadelphia was a "humbling experience" - thanked both men for their Motown-influenced sound that was uniquely Philadelphian. "[They] pioneered what would be known as the sound of Philadelphia," said the mayor. Both men thanked Kenney for the honor, with Gamble noting Kenney's singing voice after the mayor briefly sung the chorus of "If You Don't Know Me By Now." "I didn't know you could sing. You sound pretty good, brother," Gamble joked. Also, during the day the president and CEO of Wawa, Chris Gheysens, named the winner of the first ever Wawa Foundation Hero Award. The award, he said, was to be given to the leader of an community organization that "exemplify what it means to be community heroes." Cathy Brown McHale, president and CEO of Special People in Northeast, a non-profit group dedicated to supporting individuals with autism and developmental disabilities, won the award as well as a grant of $50,000 for her organization from the Wawa Foundation. The three others that were also in the running for the award - Hannah Elizabeth Lerner of the Beat the Streets Wrestling Program of Philadelphia, Tara Alexis McCoy, executive director of Philadelphia Reads and Tim Williams of the Veteran's Multi-Service Center of Philadelphia - each received a grant of $10,000 for their organizations, as well. And, finally, Kenney presented the Philadelphia Magis Award - a new award named for the Latin word for "more" - to The Edison 64. These 64 students of Edison High School served and died in the Vietnam War. Kenney reminded the audience that Edison High School's classes, from between 1965 to 1971, lost more classmates in the Vietnam War than any other high school in the country. "Think about losing 64 of your classmates," said a somber Kenney. Darryrl Johnson, a veteran and school based instructional specialist at Edison/Fareira High School, at 151 West Luzerne Street in Juniata Park, accepted the award and noted the sacrifice these Philadelphians made for the country. "It is tragic but it's a proud legacy," said Johnson. "They served with honor and distinction." Johnson said that while the city celebrated its Independence Day, the award would serve as a reminder that to the families of the Edison 64, "every day is Memorial Day." "We will always remember their courage and their ultimate sacrifice for our nation," he said.